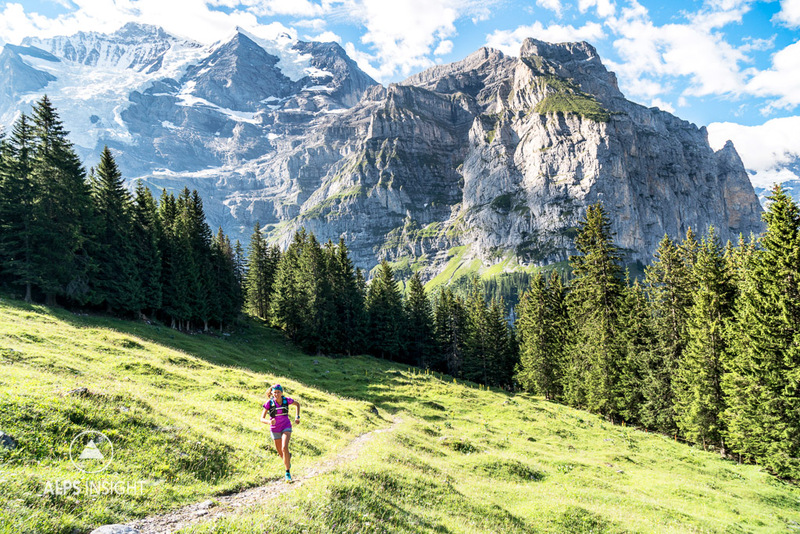 We're lucky enough to live in Interlaken, making this run home turf. 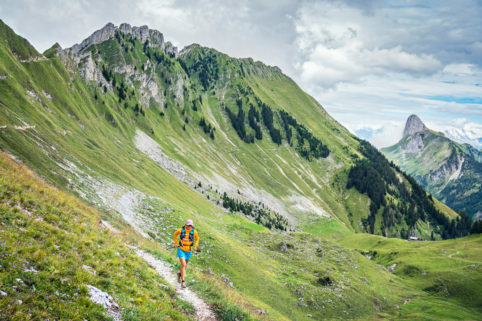 As such, I use it as my go to run when friends visit and want to see the Jungfrau Region, and get a day in on trails. 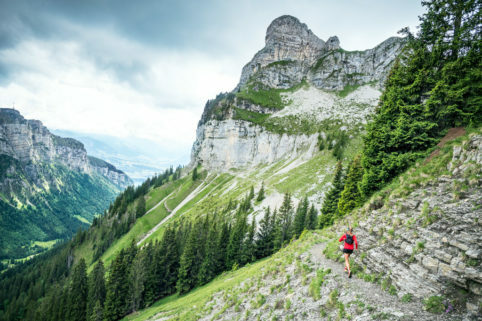 The trail starts in Lauterbrunnen Valley, unarguably one of Switzerland's most scenic and iconic areas thanks to having 3000 meters of relief and 72 waterfalls pouring down it's sides. 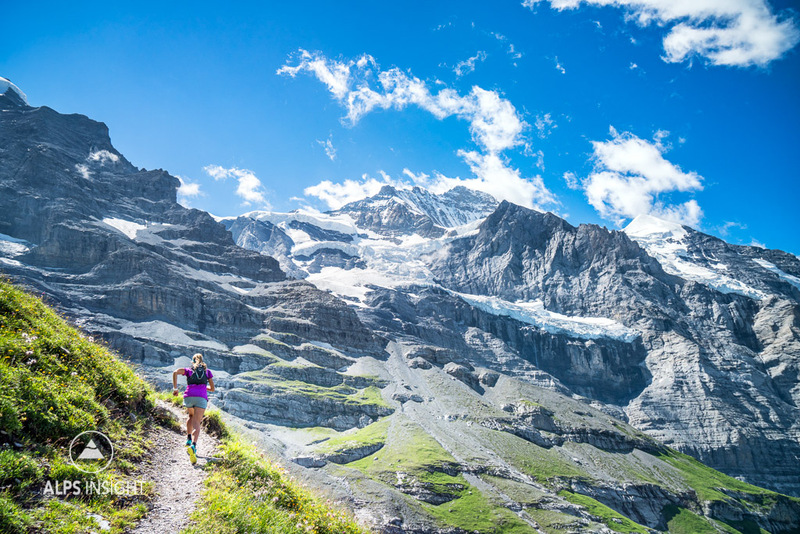 To make things more ridiculously beautiful, there are all the glaciers hanging above to provide stark contrast to the green hillsides you'll start running up on your way to the car free village of Wengen. After gaining about 1000 meters, you'll leave a short section of dirt road behind for singletrack. This is where things get even better. 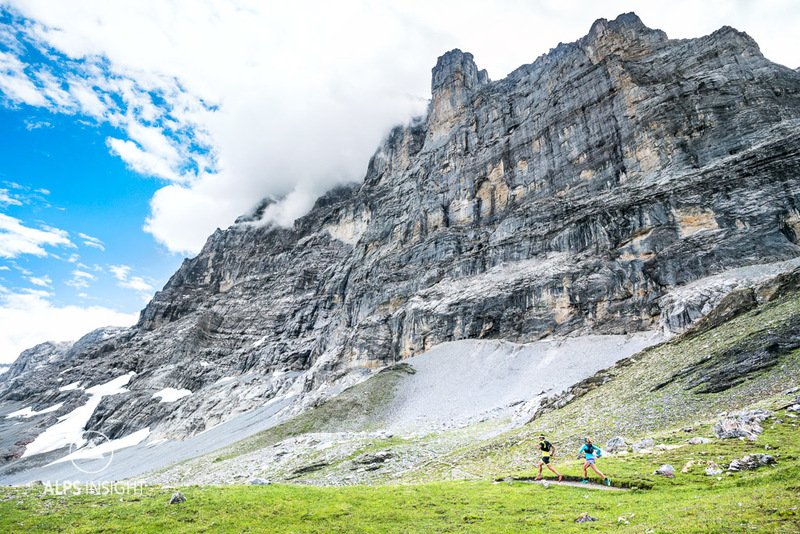 Now, you're beneath the ice covered north walls of the Jungfrau and Mönch yet still cruising up flowing singletrack which finally accesses one of the most famous pieces of trail in all the Alps: the moraine trail which serves as the final climb of the Jungfrau Marathon. Here, things get dramatic as the landscape is simply surreal thanks to 2000 meters of vertical ice and rock above. This trail leads to the Eigergletscher Station, the final stop before the train bound for the Jungfraujoch enters the Eiger. Does this all sound bizarre? 2000 meters of vertical still above you? Glaciers? A train going into the Eiger? But wait, there's more! Once you've rolled over the top at Eigergletscher you'll begin the long cruise down to Grindelwald on the Eiger Panorama Trail. You've now traded cascading glaciers hanging above you for the world's most infamous alpine north wall, the Eiger Nordwand. You'll surely stop and stare at this ominous mass of wicked looking stone and marvel at the idea of Ueli Steck's 2:22 ascent. Now it's time to continue down to Grindelwald, much of it on flowing singletrack with views that begin to take in new alpine peaks, like the Wetterhorn, which rises behind town. Once you arrive to Grindewald, you've made the journey that reveals most of what the Jungfrau Region has to offer. 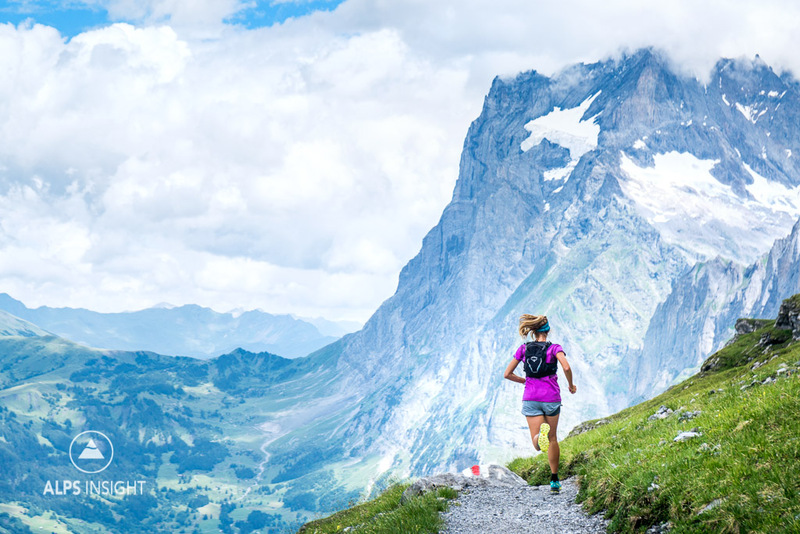 While you're in the region, don't miss the Lauterbrunnen Obersteinberg loop and Schynige Platte to Grindelwald. Save this run for the best possible weather. It truly is about the views. If the run is too much for you, there are many bailout options. 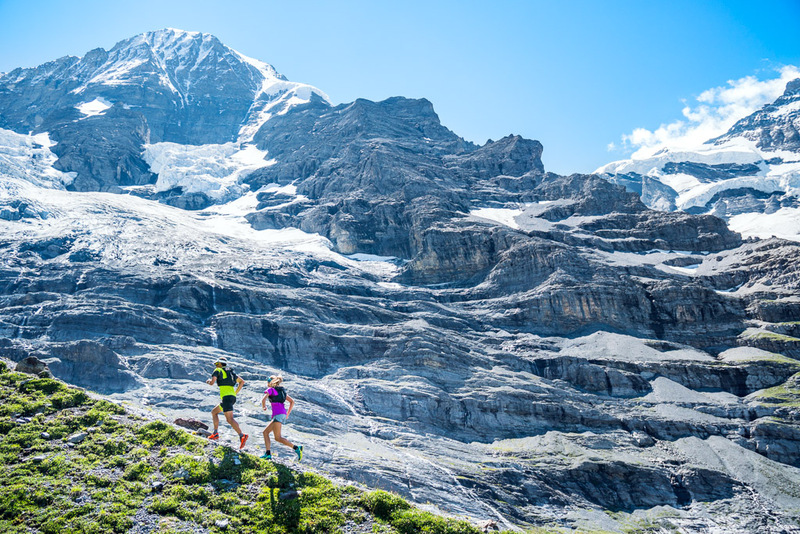 You'll be running near the Kleine Scheidegg train line with many opportunities to jump on board. Consider the stations Kleine Scheidegg and Alpiglen as ways to shorten the day. This is our home turf, so sure we're biased... but this landscape is stunning. Headed up the Jungfrau Marathon course with the Jungfrau itself looming above. Not many marathons look like this. Starting on the descent to Grindelwald beneath the Eiger Nordwand. Kim opening it up on the way down to Grindelwald with the Wetterhorn visible ahead. I will be in the Bern/Interlaken area Nov. 20-22 and would love to see lakes, mountains, etc. and this seems perfect. However, I think this is around the time y’all receive snow? Would this be available during the time I am there? Or do you recommend something else? Hi Renee, While it’s likely there will be snow throughout the region – it is still possible to at least do the same route via the train…. and if there isn’t too much snow you can still walk on the dirt road that is kept groomed for walkers. It’s just the trails that will be buried, but there are always walking routes. Have a great time, there is always something fun to do. 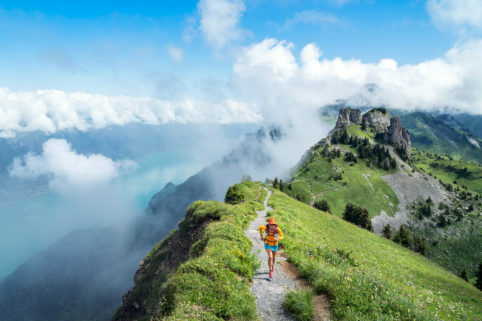 I will be in Lauterbrunnen end of March and would like to run to Grindelwald – can this be done regards weather? For the end of March the weather is unknown, but for sure it’ll be deep in snow. 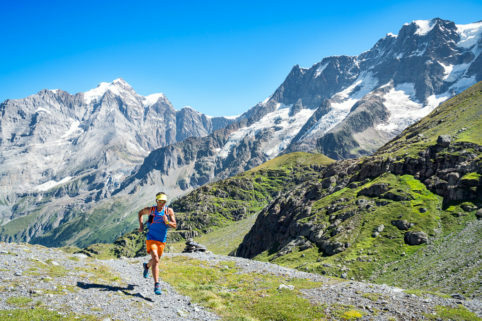 That’s not the time of year for running in the Alps, but… there are snowshoe routes if you are into that as an option. Otherwise, everyone is skiing! From Lauterbrunnen, winter hiking/snowshoeing routes will get you up high so you do have the option. Have a great visit!